“Ask yourself, ‘Are you better off now than you were four years ago?’” implored Ronald Reagan in his debate against President Jimmy Carter on October 28, 1980. Maybe it seems like the United States is on the cusp of a second recession, but in one key measure the US is finally starting to outpace inflation and population growth. That measure? Real Personal Income – personal income deflated by the Personal Consumption Expenditures Price Index – is on a definite upswing. The personal income component is defined as all income earned from production and from transfer payments from both business and government. A Chart to Run On! Here’s a graph of (recently revised) Real Personal Income, showing the measure just eclipsing the measure which peaked in the early stages of the ‘Great Recession’. So, yeah – the United States is earning more income than it was (and it is increasing at a faster pace) than it was even a few months before. For those of you reading the Presidential Tea Leaves, this is unequivocally a good chart for incumbent President Barack Obama. RPI and Personal Income are closely watched indicators since they can give an early heads up on a recession – but the numbers you see cast a lot of doubt on that scenario. There’s always a downside, folks! In this case, it’s the transfer payments component of Personal Income. 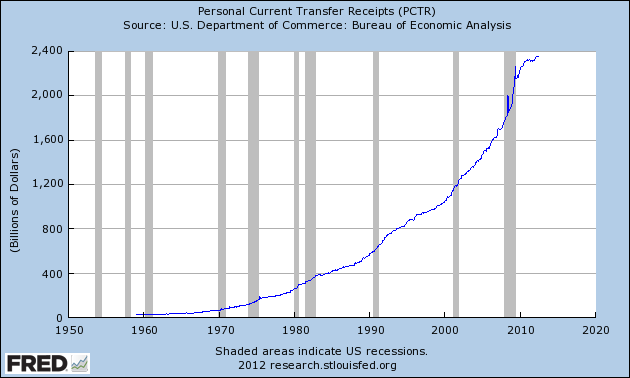 Transfer payments have risen rapidly (mostly during the recession) as seen in the chart below. Without these payments, RPI would still be lagging its peak in the early days of the recession. In hard numbers, PCTR stood at $1.792 billion in January of 2008, and now (well, June 2012) stands at a whopping $2.358 billion – a 31.5% increase in transfer receipts in only 41 months. Are you better off than you were four years ago? Should the President run on the recently revised numbers? Do you agree we’re not (currently) headed for a recession, even if growth is slow? My income has marginally increased, my home value increased and the stock market is higher. Overall I am better off! I’m impressed with the home value most – the Case-Shiller Composite-20 sat at 168.60 in May of 2008 and was at 138.96 in May 2012 (most recent). Of course, some place have held up somewhat – Denver, Boston, Cleveland and Dallas, most of all. That’s some nice real personal income increases! Bullish baby! I’ve decided to go John Galt and reduce my income and I’m loving it so far! What are considered Transfer Receipts? Is that like spending? I think I’m better off than I was 4 years ago. Actually, I know I am. Things couldn’t be better right now. But I’m not sure I can give the credit to the government for this improvement. Haha, so… no transfer payments coming your way? I didn’t mean to imply the government’s great policies were the cause of the good looking graph. Politicians take way too much credit when times are good, and blame the last guy too much when times are bad. I just wanted to share a stat that showed things are actually looking up. Like Evan, I’m trying to get arms around the transper payments portion of your piece. 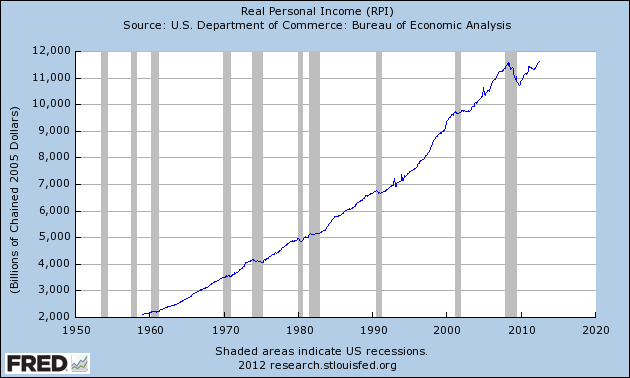 It’s interesting that personal income is higher than ever before. That’s a statistic you don’t see much when you listen to all the rhetoric out there. Am I better off? As a family, yes. Personally, I decided to sell my business about four years ago, so income-wise, I’m not even close…but that’s a personal decision. I don’t really feel like most people feel like they’re better off than four years ago. Roughly? Income you didn’t ‘work’ (currently) for… like Social Security Payments, SNAP, etc. Right – it’s a stat you don’t see too much. It does have pretty good predictive power with GDP growth, however, so parts of it are shadowed by the eyeballs on GDP. Also, since a good chunk of that improvement is from transfers it is a political minefield. Right – we bounced back nicely off that income bottom. I’m a bit more bullish on the economy than most – I think huge GDP growth is just beneath the surface. Also, watch out for Wesley Mooch! Sure, we’re doing better, but then again we’re a bullish industry (oil and gas). Sure is taken a lot of deficit spending to pay for those transfer payments. Although, when compared to the trillions thrown around hither and yon to central banks around the world, transfers like SNAP/S-CHIP/welfare/etc are probably chump change. And they are – compared to the largest transfer program Social Security. But you encapsulated a lot of the big ones right there, and they have only been increasing in the last few years. I really don’t consider that a ‘good’ sign, but if someone wanted to spin one of these graphs it wouldn’t be too hard, heh. I am very thankful to be doing better than I was four years ago. However, many of the people I know aren’t. One of the big problems with the chart above is that it lumps income into one stat and this doesn’t show income divergence. The middle class is shrinking rapidly, while the rich are getting richer and the number of people in poverty is growing. Yes – since a lot of these transfer payments are going to poorer folks a lot of these income gains are coming at the top. I’ll try to do something on the breakdown if I can get something with more detail, heh.